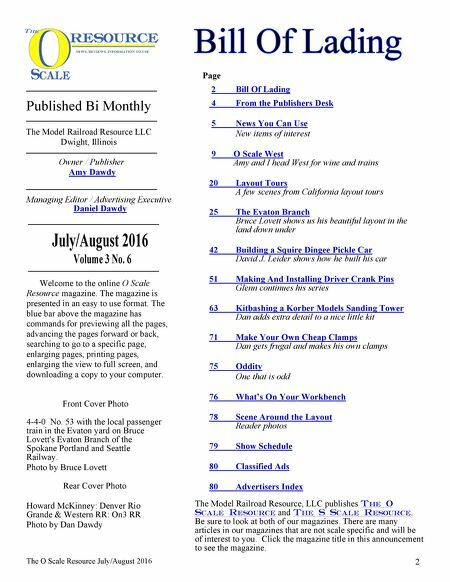 The O Scale Resource July/August 2016 2 Published Bi Monthly The Model Railroad Resource LLC Dwight, Illinois Managing Editor / Advertising Executive Daniel Dawdy July/August 2016 Volume 3 No. 6 Bill Of Lading Rear Cover Photo Front Cover Photo Owner / Publisher Amy Dawdy Page 2 Bill Of Lading 4 From the Publishers Desk 5 News You Can Use New items of interest 9 O Scale West Amy and I head West for wine and trains 20 Layout Tours A few scenes from California layout tours 25 The Evaton Branch Bruce Lovett shows us his beautiful layout in the land down under 42 Building a Squire Dingee Pickle Car David J. Leider shows how he built his car 51 Making And Installing Driver Crank Pins Glenn continues his series 63 Kitbashing a Korber Models Sanding Tower Dan adds extra detail to a nice little kit 71 Make Your Own Cheap Clamps Dan gets frugal and makes his own clamps 75 Oddity One that is odd 76 What's On Your Workbench 78 Scene Around the Layout Reader photos 79 Show Schedule 80 Classified Ads 80 Advertisers Index 4-4-0 No. 53 with the local passenger train in the Evaton yard on Bruce Lovett's Evaton Branch of the Spokane Portland and Seattle Railway. Photo by Bruce Lovett Welcome to the online O Scale Resource magazine. The magazine is presented in an easy to use format. The blue bar above the magazine has commands for previewing all the pages, advancing the pages forward or back, searching to go to a specific page, enlarging pages, printing pages, enlarging the view to full screen, and downloading a copy to your computer. Howard McKinney: Denver Rio Grande & Western RR: On3 RR Photo by Dan Dawdy The Model Railroad Resource, LLC publishes The O Scale Resource and The S Scale Resource. Be sure to look at both of our magazines. 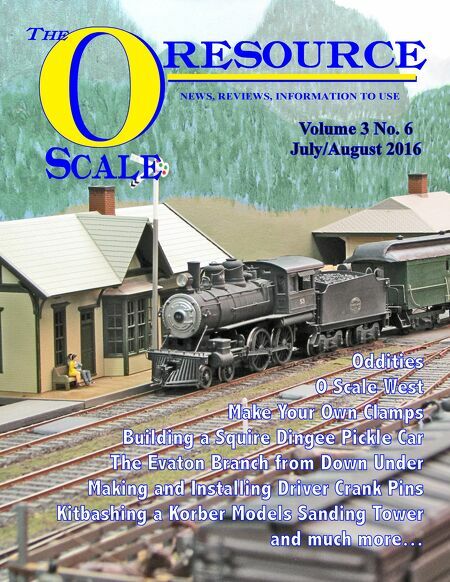 There are many articles in our magazines that are not scale specific and will be of interest to you. Click the magazine title in this announcement to see the magazine.